This program is for ages 7 – 12. 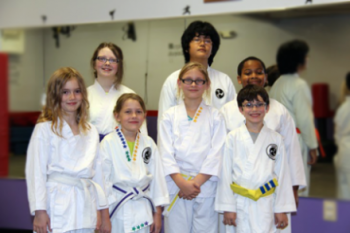 Our youth karate program focus on teaching children life skills like focus, determination, and confidence. Through our program students become stronger, develop greater endurance and improve flexibility. Understanding each child is different, we focus on their needs. 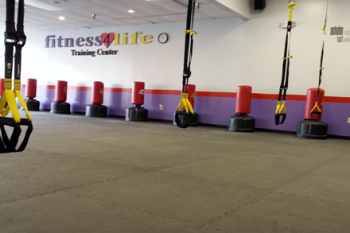 Adults have a great time getting into shape with our karate and fitness programs. The karate program will improve flexibility, endurance, balance and coordination while learning life saving skills. 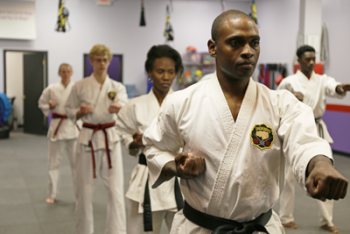 You will grow physically and mentally as you learn Traditional Okinawan Karate and Kobudo. Our fitness programs provide an awesome way to get in shape with cardio kickboxing, XFIT, CoreFit, barbell pump and flow, and Ninja Fitness. We can help design the right program for you and your family. This program is for ages 3 to 9. The key emphasis is on fitness using a variety of fun drills, kickboxing techniques, and exercises to build strength, endurance, and flexibility. The program use the principles of martial arts to help build life and social skills.